Following a successful visit to the Rock Garden by Nek Chand Foundation volunteers in February and March 2013, two more volunteer group visits are planned. The next month-long stay will be November 2nd to November 30th 2013. A further four-week group visit is planned for February 22nd to March 22nd 2014. Places are limited so please apply soon using the volunteer application form available through this website. Members of the Nek Chand Foundation yesterday visited around twenty Nek Chand sculptures in good condition and in a delightful setting at the Sri Geeta Mandir temple, Ludhiana, Punjab. ‘This is a complete and heartening contrast to our earlier trip to Ludhiana,’ said Japan-based volunteer, John Francis Cross, referring to the 2nd March investigation by three NCF members at the Punjab Agricultural University. On a recent investigative visit to Ludhiana, members of the Nek Chand Foundation from the UK and India were shocked to find all Nek Chand statues had vanished from a small rock garden on the campus of Punjab Agricultural University. 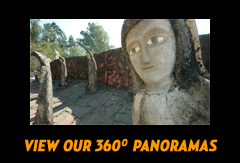 Around twenty to thirty statues and shaped rocks were once installed in the Nek Chand-landscaped area that is a popular meeting place for University staff and students. In a moving ceremony at the Rock Garden in Chandigarh respects were paid to Tony Rajer who for over a decade had been closely involved with the conservation and development of the world's largest visionary environment. Speakers included Rajpal Singh of the Punjab Arts Council, John Maizels from Raw Vision and Tony's step daughter Sarah Davitt. The final address was given by Nek Chand who expressed his sorrow at losing his 'brother' and who had arranged for a stone to be carved with Tony's likeness which will be permanently installed at the Rock Garden. The Nek Chand Foundation, a registered charity, was formed in 1997 with the aim of supporting Nek Chand's work and raising awareness of the Rock Garden throughout the world. The Foundation's projects include: creating surveys, publishing much- needed documentary and publicity material; arranging exhibitions and coordinating semi-annual volunteer trips. © 2010-2017 Nek Chand Foundation. Web development by Oculeum.